Reading Sign, and More Images of The Grass Tree or Yacca Plant. Echidna diggings. Some natives here call them Porcupine. Food in an emergency survival situation, otherwise let them be. Grass Tree, Goonagurra, Black Boy, Kangaroo Tail, Yacca, all the same plant. Uses: The inner core of the dried flower stem is used as tinder, the stem itself is used for hand drill fire lighting & making the parts for the fire-bow. The flower stem can also be used to carry fire. The nectar can be sucked from the flowers, or the flowers can be soaked in water for a refreshing drink. It can also be fermented to make alcohol. The base of the leaves when pulled can be eaten. Dried leaves make good kindling. Carrying Fire. A short video. Similar plants that can serve the same purpose in America are: The Yucca plant, & the Agave or American Aloe. Also known as Sentry Plant. This Sentry Plant also grows in Australia. Fire Lighting Problem-Not Enough Tinder. 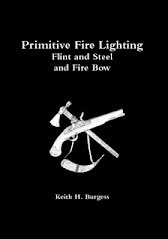 One of the problems I have noticed of late is people having trouble making fire with flint and steel. Either the kindling is damp, or hard to take fire. In either case the problem has been a lack of enough tinder. Instead of blowing and blowing until all the tinder is spent, add more tinder to your smouldering tinder. This tinder does not have to be prepared, you can just add a plant tinder as is and it will char when in contact with the smoulding tinder you are already using. This will add heat, it will also last longer until the kindling has caught fire. Uncharred Bracket Fungus added to my tinderbox. Uncharred Punk Wood added to my tinderbox. FREE PDF or Read Online. My thanks to Flintlock and Tomahawk for bringing this video to my attention. Australian Aboriginals First To Settle Both New Worlds. As a matter of interest, Australian Aboriginal genes were found in some members of plains Indians tribes some years ago. The last two known females with these genes is said to have died not too long ago. My thanks to my friend Tracker for bringing this video to my attention. Sounds Of Silence By Buxton. 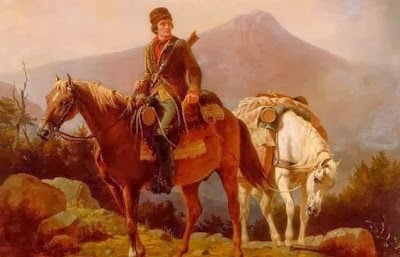 Squire Boone crossing the mountains with stores for his brother Daniel and brother-in-law John Stewart encamped in the wilds of Kentucky. 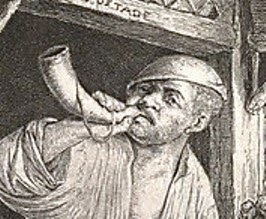 Blowing horns have been in use for centuries as a way of signaling. The signal is predetermined by the people using the horn, a series of blows could send a specific message, or the very fact that the horn has been blown could signal the coming of danger, or we have game come and help carry it. The ability to make noise lies not solely within the horn, it has no special insert within the mouth piece, the ability comes from the person blowing the horn. Some horns are carved, others are not. Some horns have a shaped mouth piece and yet others are plain. All though seem to have had the mouth piece carved out slightly to form the shape of a funnel. 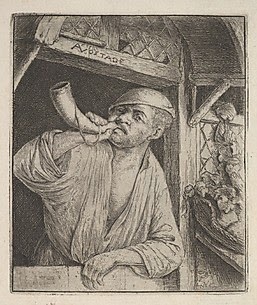 A 17th century etching of a man blowing a horn. My blowing horn. I did not make this and can't remember where it came from. The mouth piece on my blowing horn is rather crude and rough, but you can see the funnel shape cut from the hole. Here again the funnel shape on these horns is very evident. This 19th century blowing horn has been shaped and embellished, but only for aesthetic reasons I would assume, as the lips or mouth do not go over the mouth piece, only against the end. An old blowing horn found in a barn. 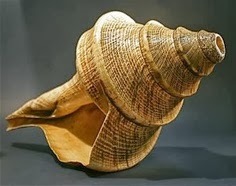 A conch shell blowing horn. 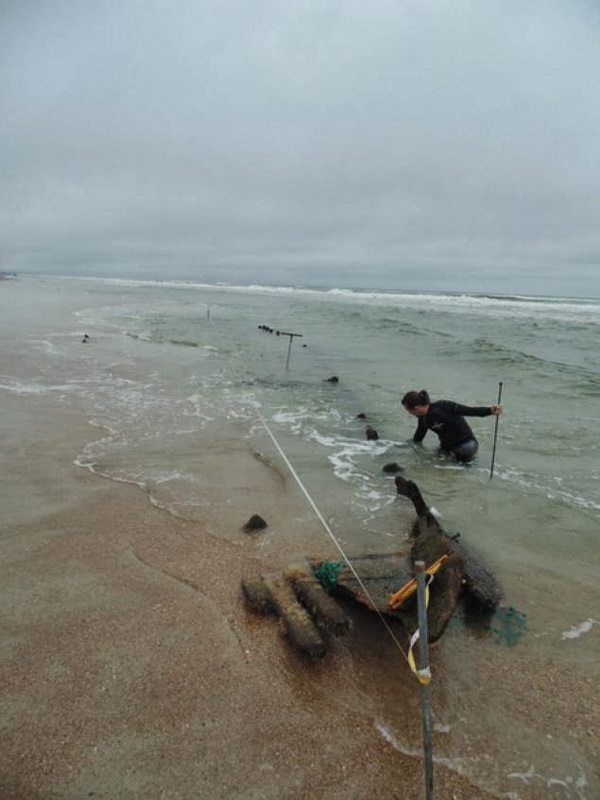 Mysterious shipwreck discovered along historic Florida shore. 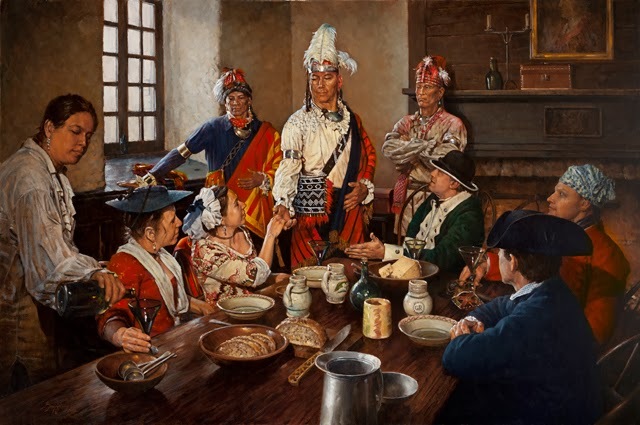 A New Living History Blog. 18th century powder Horns. Authenticity and Safety. A Video. The Gunpowder Wallet. A Short Video. 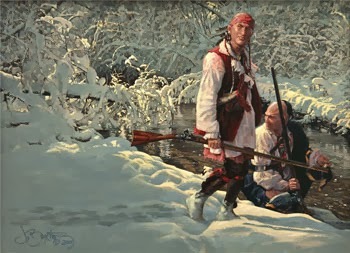 Pioneers, post Revolution. Old Film. The Weight Of Lead Versus Gunpowder. Lead is heavy, and it is probably the heaviest item I carry in my knapsack other than my brass trade kettle. 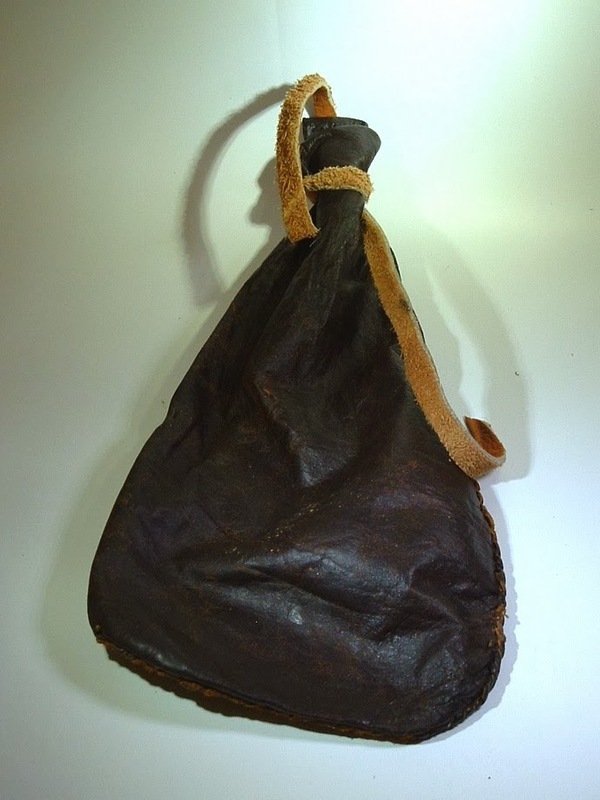 However, I limit how much lead I carry, and I carry more gunpowder in my powder horn and in my gunpowder wallets than is needed for the amount of lead that I carry. Why more gunpowder than lead? Because every time I shoot game, I retrieve the lead from the animal during the skinning and butchering process, and I then remould this lead so I can use it again. 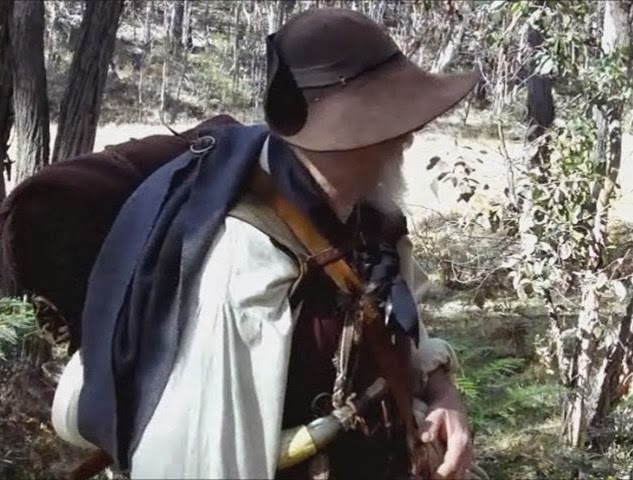 So the more gunpowder I carry, the longer I can remain in the wilderness without having to seek out a trader. I only have to carry this pack until I get to my destination. A good trap line also saves on powder and lead. I hunt on the way back each day after checking my trap line. If I have meat enough to eat from the trap line, then I don't need to hunt. But if my traps for larger game are empty, then there is still a chance of getting something on the way back home. Also I always carry some fishing tackle for set lines or regular fishing with a pole. Two of five Gunpowder Wallets. The Ball Bag which I carry in my shot pouch. Lead carried in the knapsack. Lead ladle and two moulds. One for ball, and one for goose shot. Fishing tackle carried in my belt pouch. What To Carry and Reasons Not To. Time and time again throughout history we read about a common person who neglected to carry one piece of equipment or another and how they managed to survive without it. In most cases this survival was touch and go. 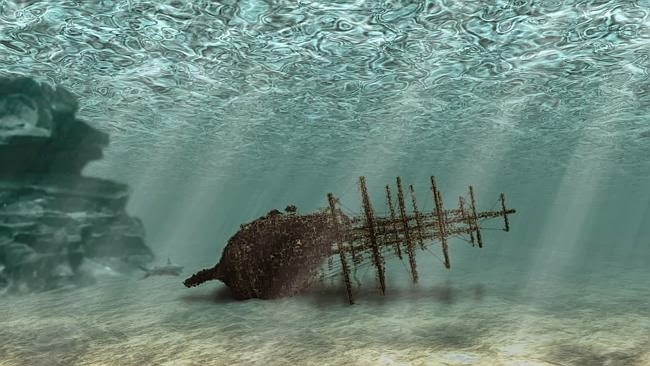 The ones that did not survive were not able to tell their tale. All the reading and research I have done over the years has lead me to several conclusions, one of those is that the average common woodsrunner was not a very smart person. So maybe we should not be trying to emulate the average woodsrunner, perhaps we would be better off learning from our own experiences and just be ourselves. Now I know I have mentioned this incident before, but the reason I use it is because it is so typical and yet surprising at the same time. 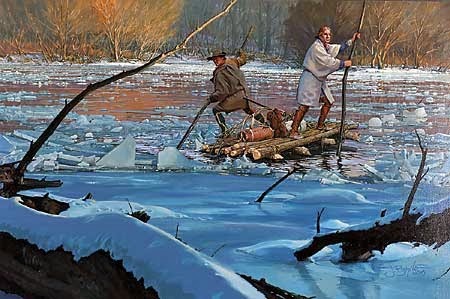 I am referring to the time when Gist and Washington were travelling together in winter with only one blunt hatchet between them. With this blunt hatchet they cut enough timber to make a raft so they could cross the Allegheny River. By all accounts they got the job done, but can you imagine how hard the work would have been? This incident poses several questions for me, one, why was this hatchet blunt? The easy answer to this question is surely that gist was not carrying a whet stone. So then I ask myself why he was not carrying a whet stone. The answer to this one has to be because he did not want to carry the extra weight. Can we assume that he intended to use a creek stone for sharpening? Maybe so, but he didn't did he! So his work was made all that much more difficult. Frankly it does not really matter what the reasons are for not carrying a particular item, it is up to us to review each item and make up our own minds as to what is needed and what is not. If not carrying something means that you intend to make it when you need it, then consider this; making an item will cost you time, and once you have gone to the time and trouble to make this item, be it a bone needle or a bone awl, or a whet stone etc, are you likely to discard this item after making it? If your answer is no, then you may just as well equip yourself with this item in the first place and save yourself the time and trouble of making one. Some packs are going to be heavier than you would have liked, but you have to compromise between maximum self-reliance, and minimum weight. Think about your trekking scenario, you may only be trekking to the bottom of your back yard, but how far would you really be travelling if this trek were real? How long are you likely to be away? Have you taken into consideration that things may not go as planned and you could be away for a lot longer? To me, my equipment is very basic. I have lived an 18th century lifestyle for over 20 years, & used this same type of equipment for over 30 years. 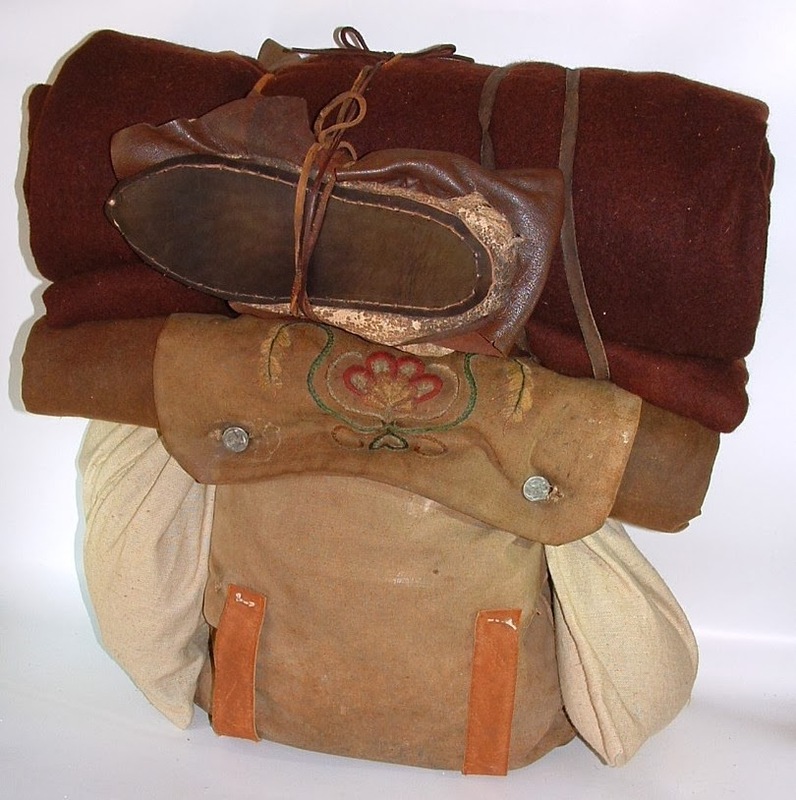 Yes I have questioned the 20 LBS of weight in and tied onto my knapsack many times, but each time I have reviewed my knapsack contents critically, I end up putting it all back in again. Probably the heaviest piece of equipment in my knapsack is my brass trade kettle. 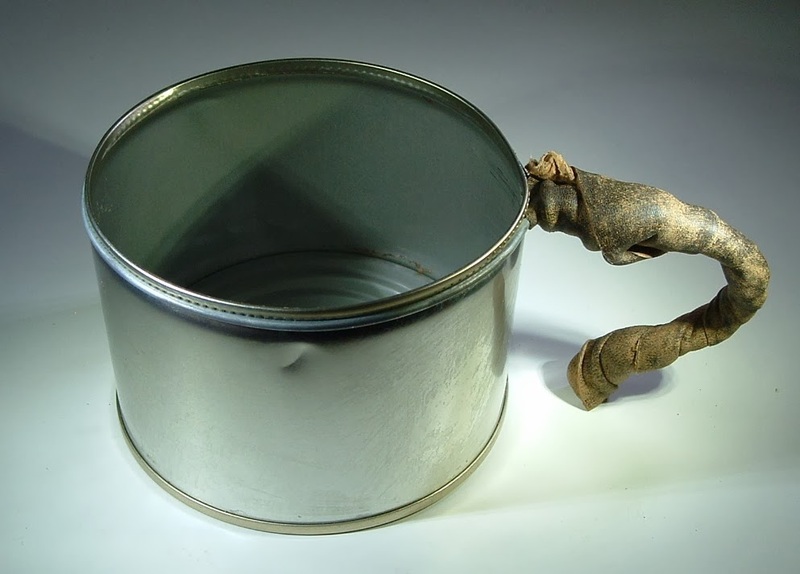 Now obviously I know that I can make do without this item, I can roast meat, and I could use my tin cup to boil water, but making stews would not amount to much, I could not boil much water to replenish my canteen, I could not catch as much rain water in my cup as I can in the kettle. So the kettle stays in my pack. The heaviest item on my knapsack is probably my blanket roll, but there is only one blanket, and in winter I consider this a necessity. Think realistically. There will be nights when it is not safe to make a fire, how will this affect you? You will have to rely on what you carry to keep you warm, if not warm then at least alive! You will have to be content with eating foods that do not require cooking; you will be drinking water and not tea. If you have to leave camp quickly in the night, will your gear allow you to do that without leaving items behind? Leaving items behind is a sure way to let people know you have been there. This is the problem with carrying your gear in a blanket roll instead of a bag. In order to use the blanket, you have to take out all your gear. For a similar reason I no longer roll my blanket up in my oilcloth, because if it rains on the trail, I would have to untie my blanket roll from my pack and all the time getting wet. As it is, I simply grab the oilcloth & throw it over me and my equipment and sit it out. Or I can make a quick shelter. I hope this short article will give you something to think about, we are all individuals, and therefore have our own needs and ideas of what should be carried and what should not. Experience is a great teacher, so get out there and test yourself and your equipment and set yourself a realistic scenario whether you are in your back yard or out in the woods for an overnighter. Think about how it would really be like. 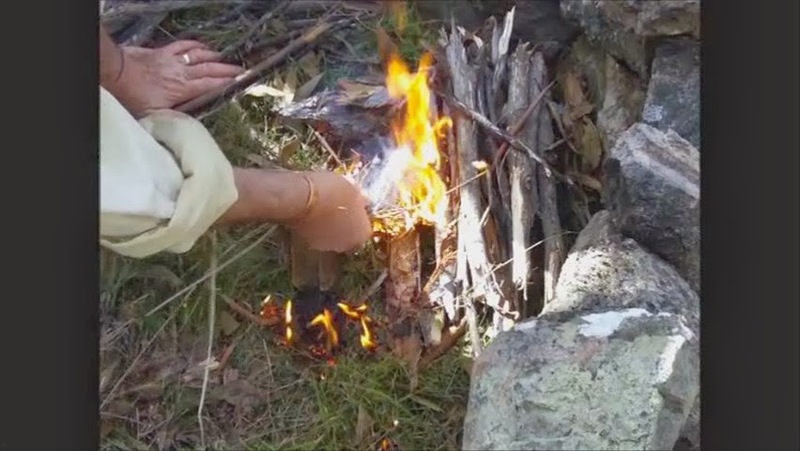 Different Ways Of Making Fire. The Introduction By Robert Griffing. At The Gardens By Buxton. Trees That Speak By Robert Griffing. 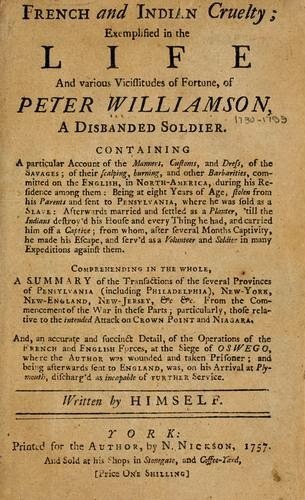 Diary Of An 18th Century Sailor. 17th and 18th Century Games. Scenes From American History No.2. 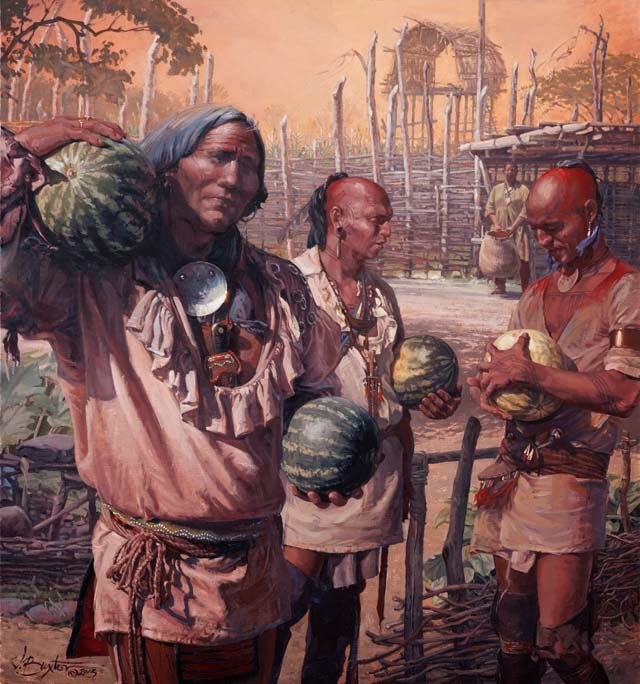 New England Settlers 17th Century . 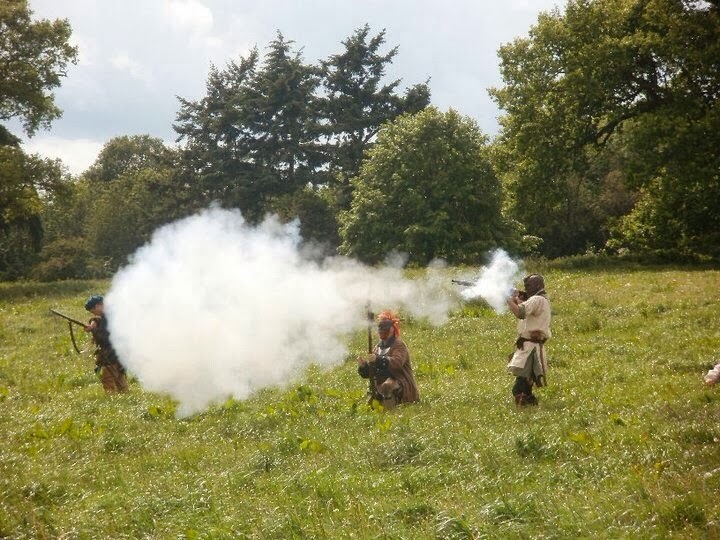 Live cannon Fire Using Shot.